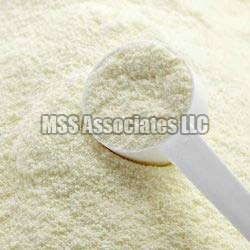 Full Cream Milk Powder / Whole Milk Powder is available principally from Suppliers in New Zealand, South America, India, and various European countries. Full Cream Milk Powder is produced from pure, natural fresh cow’s whole milk. At the dairy plant, the liquid whole milk is pasteurized, standardized to the required level of milkfat, evaporated into a concentrate and then spray dried into a powder form. It is typically available with 26%-28% milkfat and a minimum of 24% protein. A buyer of the product has the option of regular or instant and the additional option of fortifying with Vitamins A & Ds.